Apparently, it’s a good thing my chosen vocation isn’t coroner. 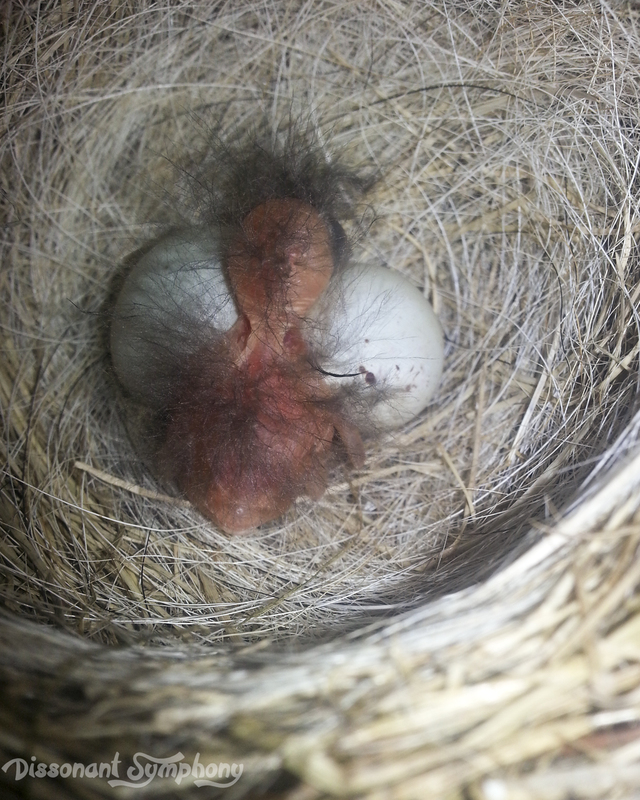 In a crazy Easter miracle, our first baby bird isn’t actually dead like I previously observed. This is clearly additional evidence that I know absolutely nothing about birds…or babies…or breathing. As he’s the first of our hatchlings, my children have named him Hydrogen (Hydro for short). Little Hydro’s body was almost imperceptibly quivering in and out when I checked the next yesterday afternoon. His pink skin pulsing with each tiny shallow breath as he nestled on the other two eggs. In absolute shock, I called the kids down for a look. He’s still face down, but definitely alive. Gazelle has been glued to the nest again the past 18 hours, so I haven’t been able to shoot new pictures. Maybe she’ll give me the opportunity as it warms up today.